Leo Moser was a mathematician who worked in combinatorics. He created, among many other things, a notation for extremely large numbers, and worked on the problem of coloring the plane. Today I want to talk about an old Diophantine problem he worked on that may be ripe for some progress. How many colors are needed to assign each point of the plane a color so that no two points exactly distance apart have the same color? The value is known to be either , , , or ; the lower bound is due to Moser and the upper bound is due to John Isbell. The following graphic used by Wikipedia shows both. The graph is called the Moser spindle, and its seven vertices with unit-distance edges shown require four colors. 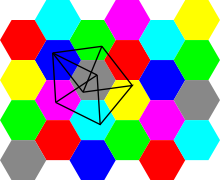 The hexagons are somewhat less than unit-distance across, but with more than unit distance to the nearest of the same color, so seven colors suffice. The seven color sets are translations of each other, and Hugo Hadwiger in 1945 had used the same pattern to give an upper bound of 7 on the related problem of tessellating the plane by congruent sets, whose best-known lower bound is 5. Paul Erdős and Nicolaas de Bruijn employed the Axiom of Choice to show that the true value is enforced by some finite unit-distance graph—which need not be a planar graph, though the Moser spindle is planar. It is known that any 4-coloring of the plane must involve color set(s) that are not Lebesgue measurable, while recent work indicates that forms of choice would be required for any 4-coloring. Thus this problem goes deep in a hurry. I cannot resist to add that I knew Isbell, since I once took a course on projective geometry from him when I was an undergraduate at Case Western Reserve. He later moved from Case in 1969 to the University at Buffalo, where he stayed until he retired in 2002. Ken did not know him there—it is a small world—but not that small. I will write soon about him and my adventure into projective geometry, which was one of the hardest courses I have ever taken. But that is another story, for another day. Theorem: Any solution with must have . Theorem: Any solution with , must have . is never an integer if are distinct primes. Do you see why? The sum is over primes. This result is due to Eric Bach and Jonathan Sorenson. The thought I have is that the equation should yield a tight bound on vs . This will not solve the problem, but it should imply that must be almost equal to , and I hope that this inequality will allow us to make some progress on the conjecture. I have not tried to work out the approximation, but I believe that some useful information could come from this. The reason we feel it is a good candidate for a PolyMath project is that investigating these equations and approximations may require computer algebra, with cases that can be worked on in parallel by different teams. Is this a possible problem? Can we at least improve the bound somewhat? for some non-zero . But this is impossible—look at the leading term of . For the polynomial equation, your approach of “look at the leading coefficient” applies to the given (supposed) identity directly, leading to a contradiction to the existence of such a polynomial. For you get , so if the sum in the middle is 1 you find . One can probably make this argument more accurate. This sounds right. If true it would eliminate some cases in the proof from the Math Monthly paper—I think. where the rightmost = is from Newton binomial theorem. So this proves k must be bounded between two positive constants times N.
c = 0.6931471806 to 10 decimals. I therefore conjecture that k must be asymptotic to ln(2)N.
ln(2) is to make further progress. This yields the correct leading asymptotic. also be doable in closed form at least for the first few terms. for all integers P,Q except for a finite set. but you cannot tell until you do it. Mathematics of Computation 78 (2009), 2283-2305. Sorry missed that. Will look at paper right away. Another line of attack is to use modulo arithmetic. Try the case where k is prime or one less than a prime and use Fermats little theorem to add up mod k. Given that k/m ~ ln 2 you can see that these cases can be eliminated. You would need some strict inequalities to make it rigorous. There may also be possibilities mod m, or mod factors of m.
Jonathan Sondow and I have been making good progress on this conjecture since I discovered it in 2008 — you might find our papers useful. We’ve got another paper in preparation which might also be of interest to you when we’re done with it.